Wednesday morning, our first order of business after breakfast was to go to the Science Support Center (SSC) and make sure that the generator we planned to bring to the field and the electric saw we’ll need to use would work well together. 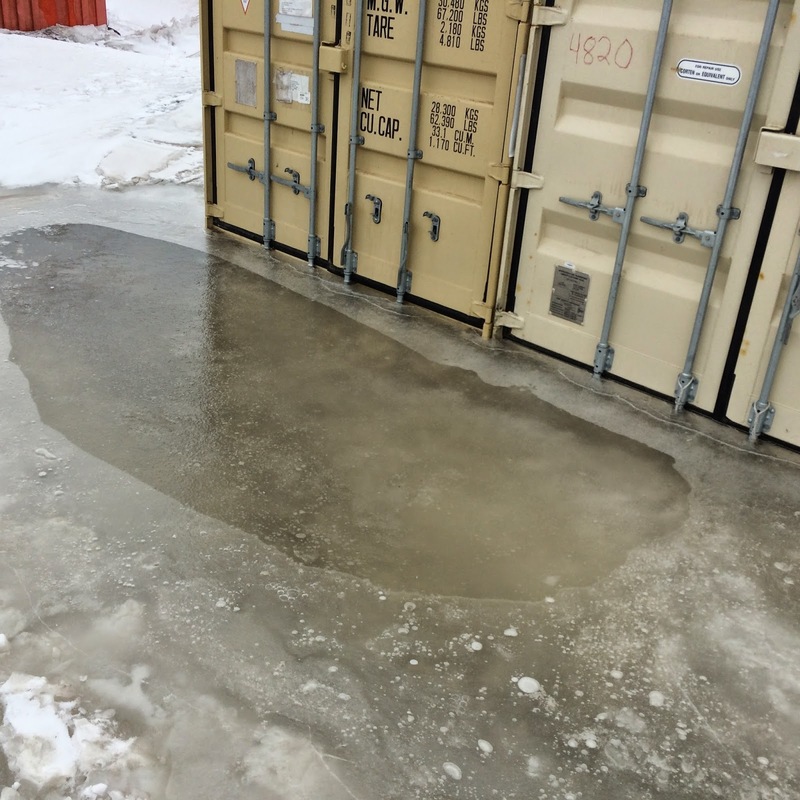 The first step was to get the saw out of our container, which is where we ran into a slight issue: the puddle in front of the container was now much deeper than Tuesday, had only a thin layer of ice across the top, and had frozen the container latch shut. 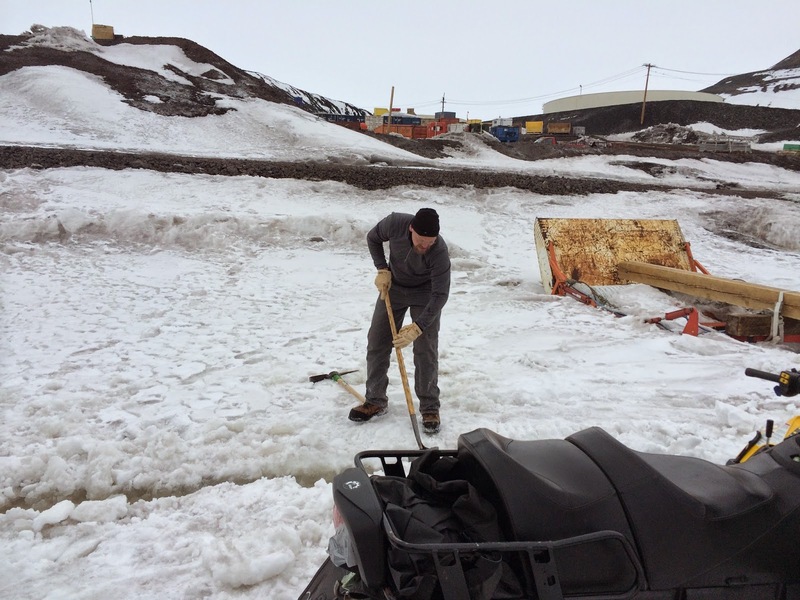 We went up to the BFC and borrowed a pair of shovels and a maddock. Back at the container, we started to dig a trench downhill to drain the water from the small lake in front of the container. 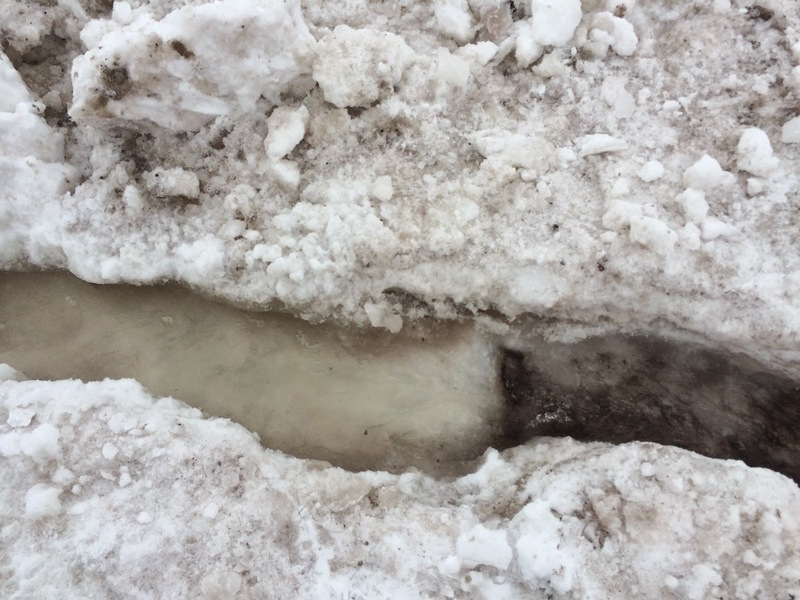 After about a half hour of digging, we had a trench dug and water flowing, but we still needed to push water from the puddle into the trench to get it going. We kept pushing water down the trench for a while, and we moved what looked like a lot of water. This started to attract attention. Thomas and Sean work on our trench. It worked well. Dale Rivers, the head of heavy equipment, showed up looking for the broken water pipe or place that was leaking water and just found us trying to drain our puddle. 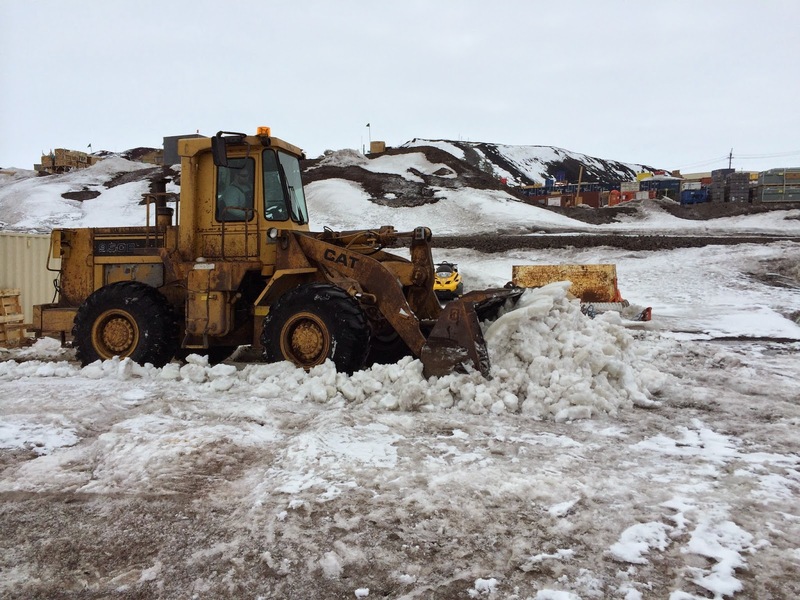 I thought we had done a pretty good job, but he called in a bulldozer and backhoe and soon enough, most of the snow nearby was gone and we had a deeper drainage trench taking the water away from the container. 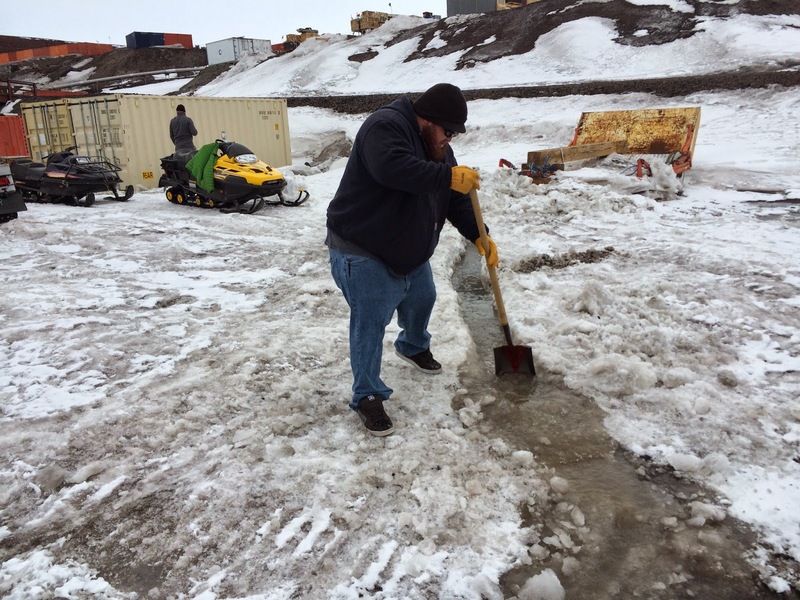 For some reason, the heavy equipment worked better than our shovels. After two hours, we were finally able to get the saw and test it. It worked fine, so we took it up to Science Cargo and checked it in. We then went out to LDB for lunch and a couple of errands. 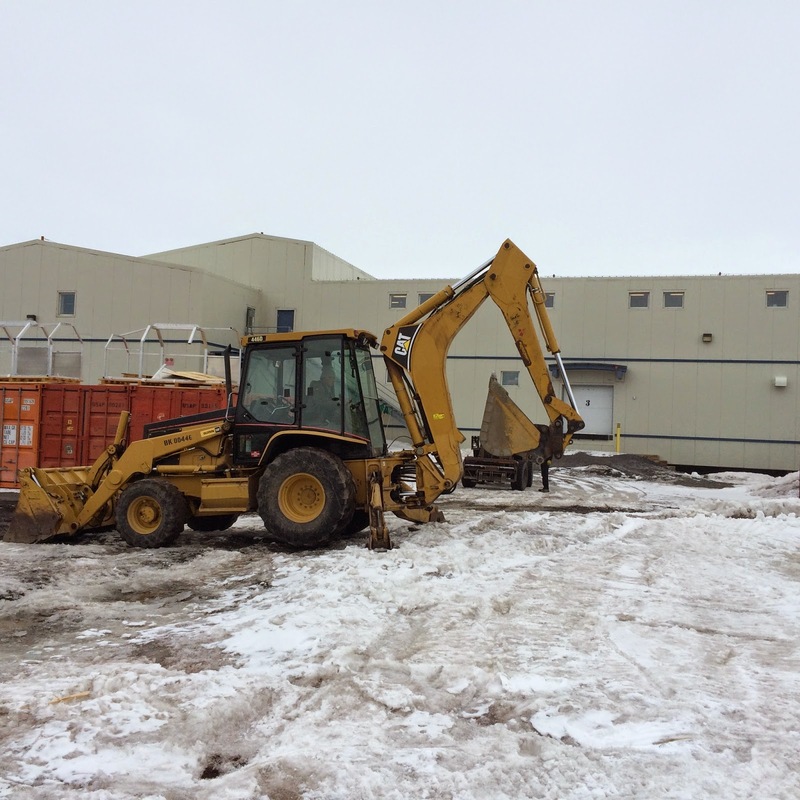 Back in town, we stopped by Crary supply to see if we could get some work gloves for the field, and also sorted more of our equipment in our container. When we went inside for a break and to make a list of all the equipment we hadn’t yet acquired/packed, I saw that there was a pressure ridge tour that night that only had a couple of people signed up. Sean and Thomas weren’t too interested, so I signed up. After we went over the list of everything new we’d thought of, we went over to meet with Lyra from the groom team and go over the plan as it stood then (it has changed since, of course). By then it was almost 6, so I went and got ready for the Pressure Ridge tour while Thomas and Sean had dinner. I was a little surprised not to see anyone else waiting for the pressure ridges, but the group turned out to be just me and the guide, Hasmin. We drove over to Scott Base, and then spent about two hours walking around the Pressure Ridges. This is the area where the land, annual sea ice, and permanent glacial ice from the Ross Ice Shelf all meet and push against each other, pushing the ice up into the air where the wind blows it into really cool shapes and formations. It’s also a spot where seals like to hang out, so we ended up getting pretty close to a few different seals. I took about 900 photos, but I put the best up in an album here. Thursday we got to work finally packing everything up for the field and getting it ready to be checked in at the Science Cargo building. We also picked up the last of the things we’ll need from the BFC, and then packed most of our tools and stuff in one large box. Other things that we’ll need, like 2x4s for making a frame for the Cherenkov boxes, and foam to put between detectors after we’ve removed them from the stack, has to go separately, but by 2:30pm we had everything checked in and ready to go. We then went over to the office and talked with James and Lyra from the groom team. The first of three Herc flights to the Thomas Hills camp got off on Wednesday and left the equipment it needed to for the geology group that will be camping there. The second flight was delayed today because of a mechanical issue. The hope is to get as much of our weight on the second flight whenever it does go out, which would allow us to potentially all fly together on the third Herc flight (and skip the need for people to go through the WAIS Divide Field Camp). Whether that’s possible or not is up in the air; in any event, it sounds like the earliest that third flight would happen is Wednesday, so we’ll definitely have a few more days in McMurdo (and probably a few changes to the plan) before we leave. Thursday was also the first launch attempt for ANITA, but it was scrubbed for some reason. I assume Dana will tell us more at dinner. Regardless, they’re going to try to launch again tomorrow, so we’ll try to see the launch if possible. The Insurance Broker a full-service all-cargo carrier providing regional and international, scheduled all-cargo service. With over 40 years of experience, Amerijet provides daily air cargo flights serving the Caribbean, Mexico, South and Central America, Europe, Asia and the Middle East.